Crash rails play a vital role in protecting walls as they dissipate impact energy along the length of the rail, without compromising the wall fixings. 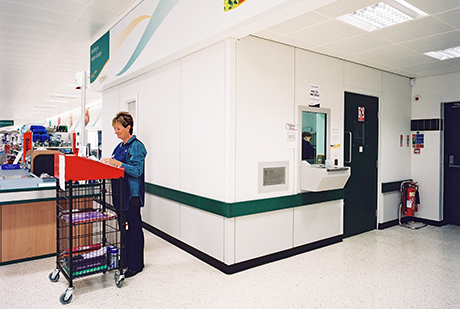 Crash rails are designed to provide impact protection in areas that are most prone to damage from objects such as medical carts, hospitality trolleys and waiting room chairs. Our crash rails are available in four formats: Acrovyn, Stainless Steel, Rubber and Timber. A variety of colours, finishes or aesthetic combinations are offered along with a wide range of heights, depths and standoffs. With such a wide range of possibilities, it’s easy to meet project requirements. Protect walls from bumps and scrapes! Acrovyn crash rails provide the ultimate in wall protection. Durable Acrovyn profiles are available in a wide range of colours, heights (ranging from 57mm to 204mm), and with different standoffs to suit project requirements. 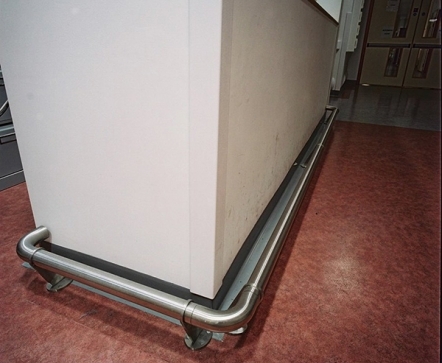 The bullnose bed guard is designed to keep carts away from walls. The 109mm high by 61mm deep Acrovyn guard flexes when hit. The continuous aluminium retainer is mounted on bumper cushions for additional wall protection. The BG-30N crash rail is perfect for chair rail applications where specific damage is recurring. The 70mm high Acrovyn profile mounts directly on a continuous retainer. The profile mounts to the wall on bumper cushions. Bed bumper locators are designed to keep patient beds in position, away from the head wall. The BL-100 crash rail is 140mm deep while the extended mount BL-200 keeps beds away from wall up to 305mm. Be sure to specify bed width. FR-225N is a 57mm deep, low profile rub rail wall protector featuring a curved impact resistant Acrovyn cover (available in 30 colours) over a continuous aluminium container. FR-251N is a 64mm high contemporary chair rail. The depth is 29mm with field mitred ends. The rail installs with adhesive and complements the Saratoga Wall System. Fr-252N is a 64mm high colonial style chair rail. 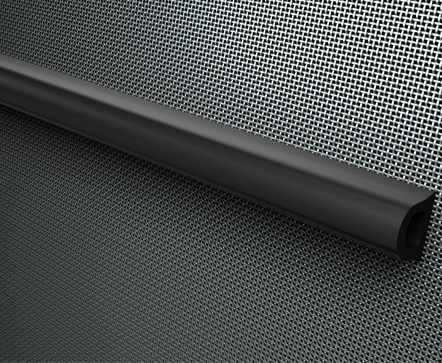 The 29mm deep rail installs with adhesive and complements our Saratoga Wall System. The FR-252N is a 64mm high colonial style chair rail. The 29mm deep rail installs with adhesive and complements the Saratoga Wall System. The FR-270N is a simple half-round chair rail, perfect for walls that are constantly being scraped. The FR-270N can be ordered in a variety of solid colours and ‘Chameleon’ patterns. 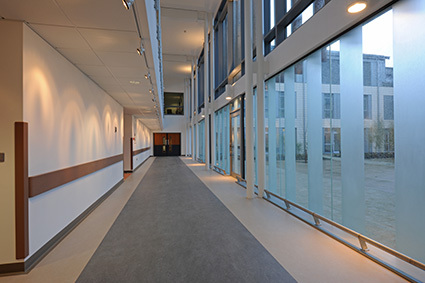 Rubstrips provide an economical solution for areas that get scuffed. Material is cut to specified heights using 1mm or 1.5mm thick sheet material. Rubstrips feature top and bottom tapered edges and mount with adhesive or tape. Stainless steel rubstrips are also available. SCR-40N is a solid crash rail for moderate abuse environments. The crash rail features a standard continuous retainer. Bumper (BCR-40N) and extended (ECR-40N) mounted profiles are also available. Designed for higher abuse environments, the SCR-48N crash rail provides 153mm of surface protection. Surface mounted applications utilize aluminium clips (SCR-48N) or full aluminium retainers (SCR-48mm). Bumper model BCR-48 and extended mount ECR-48N available. 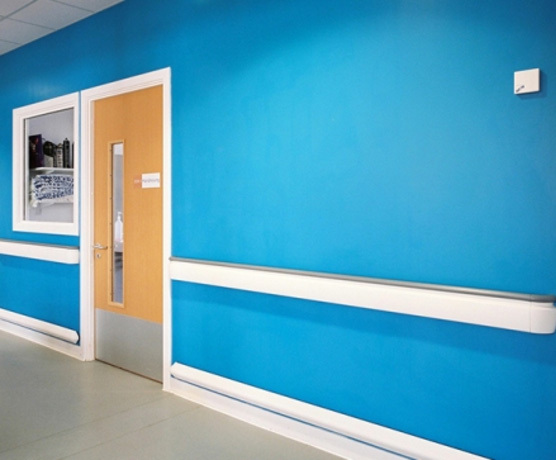 This crash rail, with added shock absorption offers serious wall protection along with a clean and unobtrusive appearance. The SCR-50N includes a full length recycled cushion attached to 25.5mm wide clips for that extra shock absorption. The BCR-50N features a continuous aluminium retainer. SCR-64N is the perfect crash rail for high abuse environments. With a full 204mm of surface protection, the SCR-64N contours to the irregularities of drywall, thanks to its retainer/clip system. Full aluminium retainer (SCR-64MN), bumper (BCR-64N) and extended (ECR-64N) mount profiles also available. The SCR-80N crash rail features a full 204mm of wall protection designed to keep carts and wheelchairs from damaging walls. Surface mounted applications utilize aluminium clips (SCR-80N) or full aluminium retainers (SCR-80MN). BCR-80N is also available for bumper mounted applications. Protect walls from bumps and scrapes! 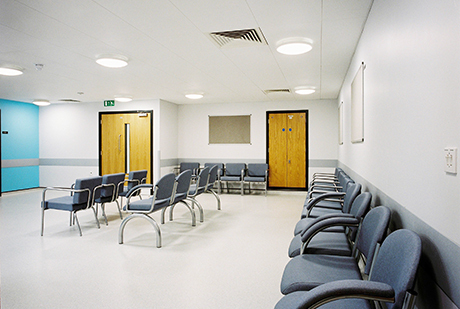 The use of stainless steel is ideal for areas where hygiene is of paramount importance. 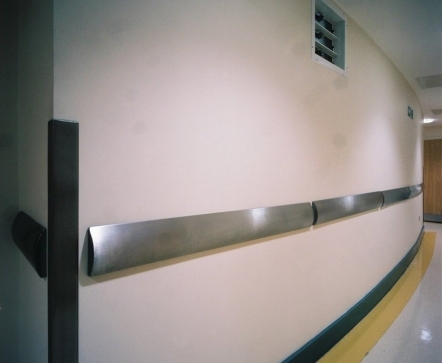 Stainless steel crash rails provide a smooth, sleek solution for interior wall protection in health and commercial environments. 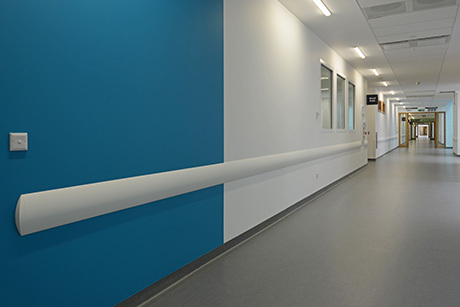 Stainless steel crash rails are ideal for areas where cleanliness and hygiene are of paramount importance such as kitchens, laboratories and pharmaceutical areas. Available in grade 304 as standard. 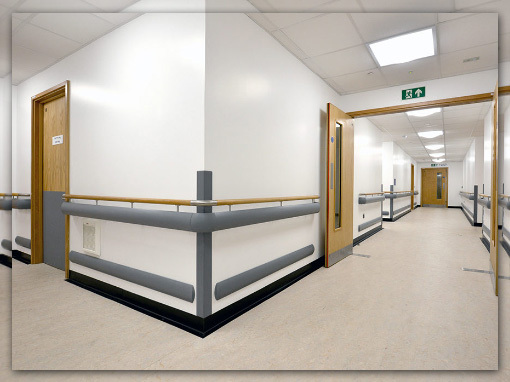 The ECR20 is a collection of 50mm high aluminium or stainless steel crash rails providing a clean, modern look. Mounted on tubular S/S brackets, at project specific stand-offs, the ECR20 can be used as a handrail as well as a crash rail. As standard, the ECR20 comes with radiused, prefabricated end caps and is supplied ready to install at the correct lengths. NOTE: 2 brackets are needed to join lengths together. ECR32 is a 102mm high, flat profile stainless steel crash rail, featuring radiused, pre-fabricated end-caps. This crash rail offers ‘severe protection’ making it suitable for use in distribution and circulation areas with heavily laden trolleys. Supplied ready to install at correct lengths. 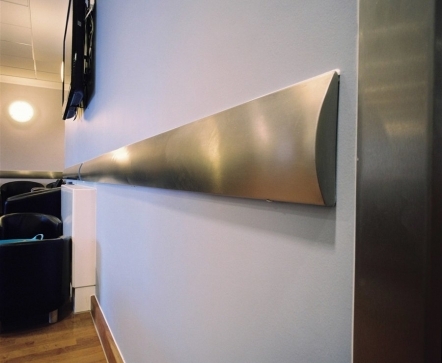 The crash rail is mounted on tubular stainless steel brackets at project specific stand-offs. The ECR 32 can be used a handrail as well as a crash rail. 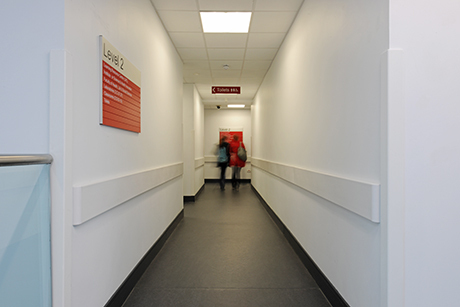 LLRSS is a 178mm high, severe duty, low level stainless steel crash rail ideal for protecting fully glazed corridor walls. Can be mounted on the floor or the wall. The CS LLRSS low level stainless steel crash rail acts as a buffer for heavy wheeled items, offering severe duty impact protection. Manufactured from grade 304 stainless steel as standard the LLRSS is a sleek, modern and robust solution that you can count on to protect your vulnerable glazed areas. 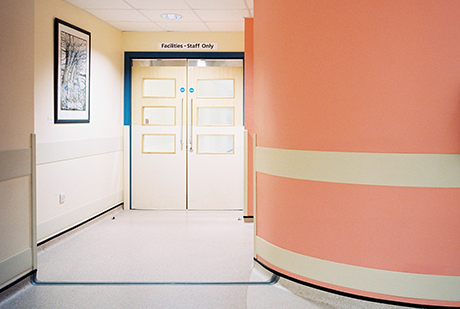 Glass Protection films go some way to keeping glazed areas safe, keeping the damaged glass fragments together, but they don’t stop the impact damage from occurring, in healthcare environments, with hospital beds and large trolleys moving about the corridors, this is of particular concern. 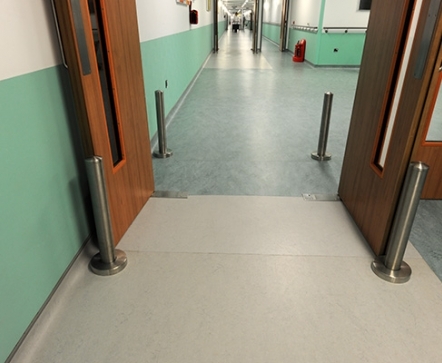 Mounted securely to the floor, or bottom glazing mullion, products like the CS LLRSS low level stainless steel crash rail acts as a buffer for those heavy wheeled items, offering severe duty impact protection and peace of mind for the building owner. Manufactured from grade 304 stainless steel the LLRSS is a sleek, modern and robust solution that you can count on to protect your vulnerable glazed areas. With LLRSS designers can still use glass to take advantage of the above mentioned benefits, without the worry of smashed panes. The SCR-16SSV crash rail is manufactured from 16-gauge stainless steel. This profile mounts to the wall with 2″ stainless mounting clips 32″ O.C. A plain faced model SCR-16SSP is also available. Excellent protection for areas prone to damage from vehicular traffic. EPDM rubber crash rails, bumper and corner guards have excellent shock absorbency and weather resistance. They offer excellent protection to areas that are prone to damage from vehicular traffic. 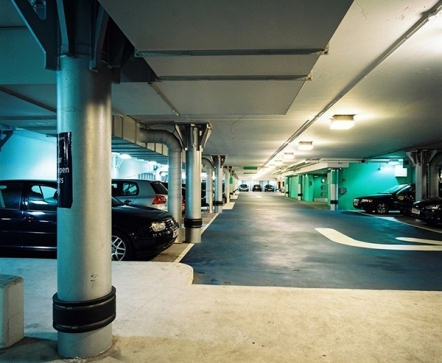 Acrovyn rubber products are suitable for fixing directly to concrete, steel, masonry and timber. 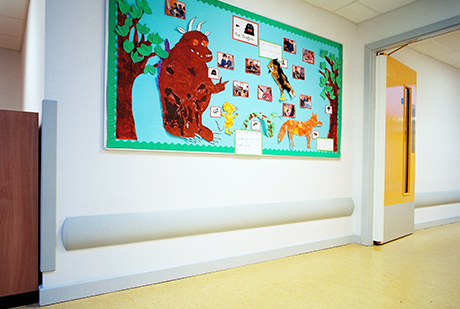 They are ideal for back-of-house and delivery area wall protection. A tough 200mm high, EPDM rubber crash rail capable of withstanding the toughest knocks from back-of-house, delivery & car park areas. The flexible EPDM rubber compound allows the crash rail to be attached to circular columns using steel bindings. Optional light reflective tape inserts help make the crash rail stand out better in dark car parks or delivery bays. The 200W30 & 200W50 crash rails are suitable for interior & exterior applications. Why use 200W30 | 200W50? The 150W20 is a 150mm high, slim-line EPDM rubber crash rail capable of withstanding severe duty impact. A snap-in cover strip conceals the mechanical fixings for the 150W20, ensuring a clean, fixing free finish. Suitable for interior & exterior applications the 150W20 is perfect for back-of house areas & delivery bays. Two D-section, severe duty rubber crashrails for back-of house & delivery areas where heavy moving vehicles are present. Standing at 75mm & 100mm high respectively, the 75D and 100D are suitable for interior & exterior applications providing extensive protection just where you need it. The hollow D-Section allows compression under impact to dissipate the force of impact & protect the wall. Optional rubber end plugs & bolt bung covers hide the fixings from view for a smooth finish. Why use 75D | 100D? The 60B rubber crashrail is a discreet B-section crashrail offering heavy duty protection for vulnerable back-of-house areas. Fixed securely to the wall through a continuous, aluminium fixing strip the 60B is capable of withstanding bumps and scrapes from heavy moving traffic. Perfect for interior or exterior applications the 60B is weather and temperature resistant. Protect walls from bumps and scrapes. The Renaissance range offers a stylish wooden and stainless steel finish providing a natural, modern look whilst protecting the wall from damage. The AW-CRVB is a 140mm high wood crash rail that offers a protective feature bumper. A plain face model (AW-CR) is also available. This rail is available in a variety of standard and custom wood species and finishes. The stainless accents of the CRWS-1 align perfectly with the wood. The ends of the rail feature contoured stainless steel end caps or optional wood caps. All steel components can be powder coated. This classic wood crash rail incorporates three 1/8″ wide stainless inserts. The CRWS-2 includes stainless steel end caps with black inserts that allow for proper expansion and contraction of the materials. Wood caps also available. The stainless steel face of the CRWS-3 crash rail is framed by wood accents. The ends of the rail feature contoured stainless steel end caps or optional wood caps. All steel components can be powder coated. A wooden version of the FR-225N, this wood chair rail is offered in a variety of standard and custom wood species and finishes. The FRW-225 features a field mitered end and installs with clips. Classic wood chair rail including a 6.4mm feature insert that is available in 3 colours. The rail is available in a variety of standard and custom wood species and finishes. The FRW-270N is a handsome yet functional rail that combines our half-round FR-270N Acrovyn accent rail inset in a finely milled wood chair rail. The Acrovyn extends beyond the wood to provide protection. FRWS-1 is a 51mm high colonial style chair rail featuring a stainless accent on the real wood face. Stainless end caps are standard, but wood caps can be specified. This cut to size rail mounts on 25.5mm wide stainless steel clips. This classic wood chair rail incorporates two 3.2mm wide stainless inserts. The FRWS-2 includes standard stainless steel end caps. Optional wood caps can also be specified. This cut to size rail mounts on 25.5mm wide stainless steel clips. This 51mm high crescent-shaped wood chair rail is protected by a flush stainless steel guard. Stainless caps are standard; optional wood caps are available. The FRWS-3 rail is supplied cut to size and mounts on 25.5mm wide stainless steel clips.